Summerset Arts Festival is back, baby! And this year, it’s even better than before, jam-packed with 19 days of entertainment that you can enjoy in the summer sunshine and on balmy evenings with your besties. 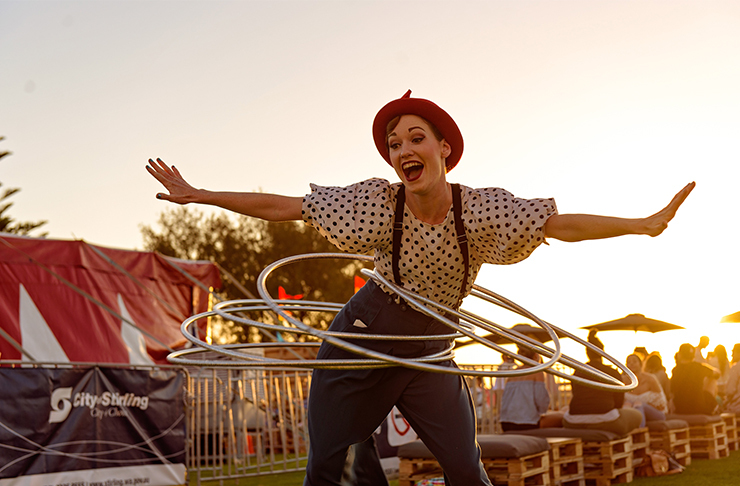 There are over 50 free and affordable events to catch all over the City of Stirling between Wednesday 24 January and Sunday 11 February, including circus acts, comedy shows, live music and official Fringe World performances. Here’s everything you can’t miss at this year’s Summerset Arts Festival. The Seaside Spectacular brings together aerial acrobats, lolly pop lyras and mermaids to commemorate the tenth year of the Summerset Arts Festival. Pack a picnic or grab a bite to eat at one of the great restaurants nearby and enjoy a night of fun by the sea. For more information, click here. 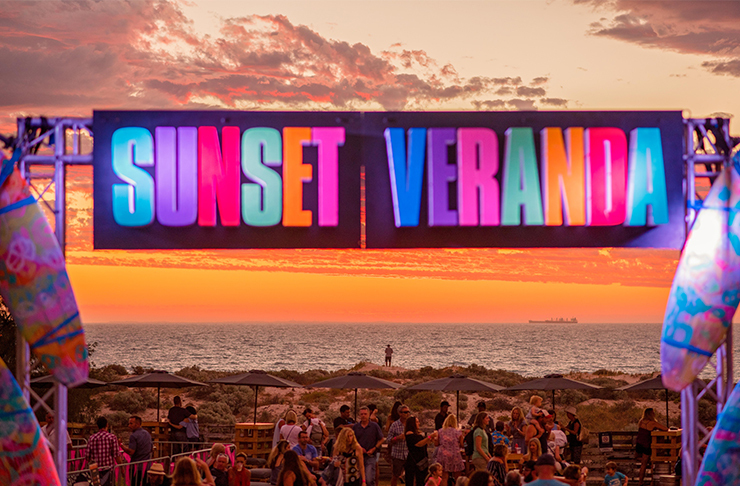 Kicking off from 5pm, the Sunset Veranda on Brighton Reserve will swing open it’s doors with music, a pop-up bar and tasty eats. And with Australia Day the next day, there really is no excuse not to head there and enjoy a couple of drinks with the sea breeze blowing in your hair, before coming back to do it all over again the next day. For more information, click here. 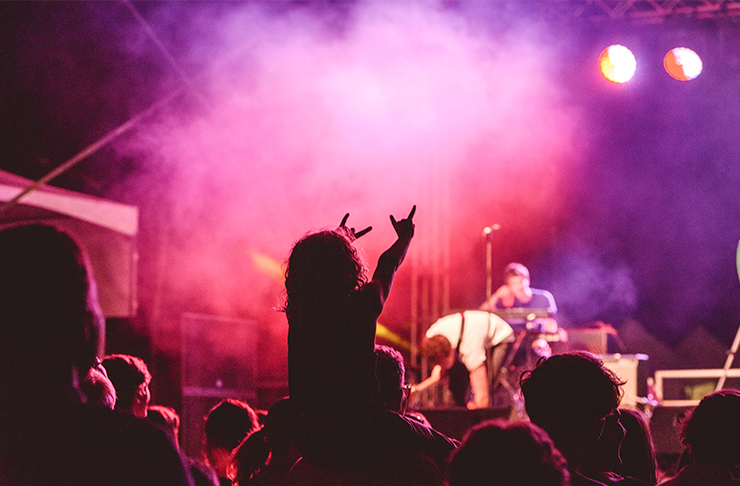 Whether you’re an aspiring musician or a pro, the City of Stirling invites you to the Scarborough Beach Amphitheatre for an evening of community jams with other local music makers. Bring along your instrument of choice and throw any inhibitions out the window. For more information, click here. Your Thursday nights in summer just got a whole lot better thanks to the Sunset Markets. Bring plenty of cash because you’ll no doubt want to pick up a few things from the local artisans and food trucks. For more information, click here. With risqué daredevil acts, Voila Variete offers a little bit of everything, including comedy, burlesque and circus acts. This 18+ show is not to be missed. For more information, click here. Every Saturday and Sunday evening throughout the festival there’ll be live musicians singing sweet melodies for your ear holes at the Sunset Veranda. The best bit? It’s absolutely free. Grab some eats and a drink or two and sit back and enjoy the sunset and some sweet tunes. For more information, click here. You either love jazz or you hate it, but if you’re in the love camp along with us you’re not going to want to miss Jazz In The Park. Popping up at Yokine Reserve on 28 January from 1pm to 4pm, bring a picnic and a rug and enjoy some doo-bop. For more information, click here. Every Sunday during the festival the City of Stirling Administration Centre carpark will transform into a farmers’ market wonderland. Grab some coffee and pick up your weekly goods from local growers and producers. Once you’re done, put your feet up and enjoy some entertainment from local performers. Plus, don’t miss the Chinese New Year edition of the farmers’ market on 11 February! For more information, click here. Award winning comedy hypnotist Matt Hale is back this year for some Fringe fun. We’ve been assured his performances do not include swinging watches or chickens, just a whole lot of laughs. For more information, click here. If you haven’t made it to the Inglewood Monday Night Markets, you’re really missing out. Perth’s best food trucks descend upon Beaufort Street so you can enjoy a roving dinner, as well as pick up some supplies for the week ahead. For more information, click here. You’re promised plenty of trivia, prizes and fun at the Summerset edition of Pop Rocks Quiz. Start assembling your teams of four to six people and studying up on music from the 60s, 80s movie scores and 90s cult games. For more information, click here. We could all do with more beautiful blooms in our lives and if you’re keen to learn how to create your own floral creations Blooms and Bubbles is for you. Join Stacey from Beans & Bunches and learn how to make flower hearts, circlets or hanging pomanders while sipping on champers by the beach. Does life get much better than this? We don’t think so! For more information, click here. Anyone who’s a fan of Cards Against Humanity will love Comedians Against Humanity, hosted by Yianni Agisilaou. The audience will seal the fate of the comedians on stage as they improvise their way to comedy gold. For more information, click here. World class comedians are making their way to our shores to treat you to a night ab workouts (read: lols). The Summerset Comedy Gala is always a sellout, you’ve been warned! For more information, click here. A photography exhibition unlike any other, Fragmentation & Fusion takes a look at our techno-heavy society and whether the images we capture on the daily represent the truth. All images will be available for you to purchase for just $35 and there’ll be a Vietnamese food truck standing by. For more information, click here. We could all use a little more laughter in our lives, so start your weekend in fits of giggles at Laughter Yoga overlooking Scarborough Beach. Not only will you get lots of laughs in, you’ll also work on your flexibility, posture, balance and concentration, boom! For more information, click here. After sellout shows at Fringe last year, Lady Velvet Cabaret is back to perform Symphonies of Sensuality, the sequel. Combining burlesque with classical music, you don’t want to miss out on tickets to this one, folks. For more information, click here. If you love to snoop around as much as we do, Artist Open Studios is the event for you. Some of the City of Stirling’s artist extraordinaires are opening their doors to let you watch them weave their magic. You’ll also get the chance to buy a few new pieces to hang on your walls—we’ll see you there! For more information, click here. Bid the Summerset Arts Festival adieu with the likes of Harts and The VANNS at the Summerset Concert. There’ll be delicious eats for all to enjoy, along with tunes from WA musos The Money War and Elli Shoen. For more information, click here.